Dr. Jeffrey M. Briglia attended Rutgers University, college of pharmacy and received a Bachelor of Science Degree in Pharmacy. He graduated from Philadelphia College of Osteopathic Medicine in 1993 and completed his residency in Otolaryngology, Head and Neck Surgery, Facial Plastics and reconstructive surgery in 1999. Dr. Briglia is board certified in Otolaryngology and Facial Plastic Surgery. He is also a Fellow of the American Osteopathic College of Otolaryngology, Head and Neck Surgery. Dr. Briglia practiced general otolaryngology in Allentown, PA prior to joining Bucks ENT Associates in July, 2008. 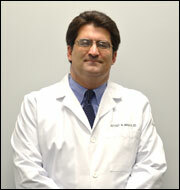 Dr. Briglia resides in Bucks County with his wife and two children.